The history of Napoleon House in New Orleans inspired my novel Napoleon in America. According to legend, Nicolas Girod, the original owner of Napoleon House, plotted with pirates to rescue Napoleon Bonaparte from St. Helena. 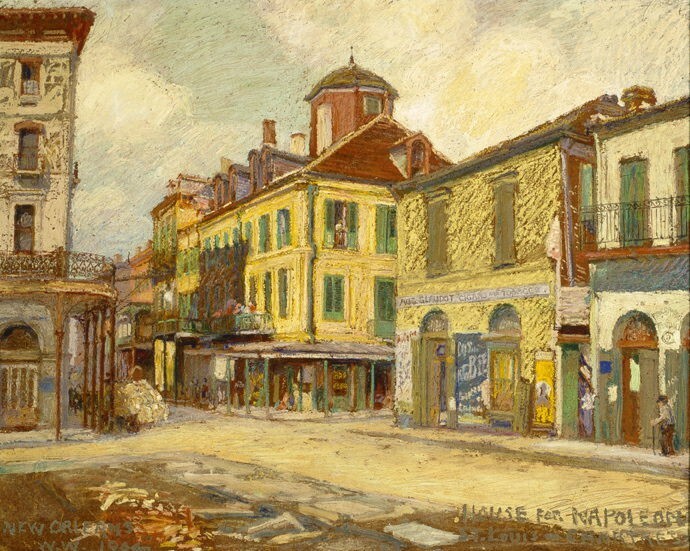 Napoleon House, New Orleans, 1904, by William Woodward, The Historic New Orleans Collection, Gift of Laura Simon Nelson, acc. no. 2006.0430.18. Nicolas (or Nicholas) Girod was born in 1747 or 1751 in the Savoy region of France. In the 1770s, he and his brothers Claude François (or François Claude) and Jean François migrated to North America. They settled in New Orleans, which was then under Spanish rule and had a sizable French population. The Girods prospered as importers and merchants, keeping a wholesale and retail store near the levee landing and buying extensive property in the city. Girod was re-elected in September 1814. Several improvements to the city were made during his administration, including paving sidewalks with brick gravel and digging the first drainage canal. However, Girod is best remembered for being mayor during the War of 1812, particularly during the Battle of New Orleans, which took place January 8, 1815. Girod was instrumental in helping General Andrew Jackson organize the locals into militias, in providing military supplies, and in guarding against internal subversion. It is said he was motivated more by hatred for the British than by love for the Americans. Girod resigned as mayor on September 4, 1815, citing a need to salvage his wanting personal finances. (2) In 1812 he and some partners had set up an early savings and loan organization, to help people finance their homes and businesses, which had not done as well as expected. Meanwhile, his brother Claude died in 1814, leaving Nicolas a property at the corner of St. Louis and Chartres Streets with a “(two) storied house…and dependencies.” (3) Girod built a grand three-and-a-half story Creole townhouse on the site, either adding to the existing house or constructing a new one. The ground floor was occupied by Girod’s store; he lived in the apartments above. The architect may have been Jean-Hyacinthe Laclotte or Barthélémy Lafon. A notable feature was a spiral staircase leading to a cupola on the roof. We now arrive at the story that inspired Napoleon in America: namely, that Girod built or furbished the house as a residence for Napoleon, and organized a group of pirates to rescue the former Emperor from exile on St. Helena. Though unsubstantiated, this tale first appeared in print in the late 19th century, was commonly recounted in the press in the early 20th century, and remains popular today. The following is a typical version, printed in the New York Tribune in 1920. The news of Napoleon’s exile grieved M’sieu Girod sorely. Perhaps breathing the air of the land of the free made his bold Gallic heart bolder, and it may be that contact with the pioneers of the New World augmented his daring. At any rate he began to saunter down Chartres Street in the evenings, and when at the corner of St. Philip Street would drop into the blacksmith shop kept by Jean and Pierre Lafitte, a couple of retired pirates, who, though now apparently men of peace, still loved any adventure that promised a reasonable chance of killing or being killed. The Lafittes were intent listeners to the audacious scheme unfolded to them by M. Girod as they conversed amiably before the forge in the evenings. At their recommendations, M. Girod took into his confidence one Dominic You, and plans went immediately into the formative. The plan was simplicity itself, in the telling of it. It was merely to make a quick dash upon St. Helena, overpower the British guards, bear away the Emperor, conduct him to a swift yacht and sail off to America. The energetic Lafittes selected a two-fisted crew to man the fast and comfortably equipped craft provided by the promoter of this brilliant kidnapping enterprise, adding a noted soldier of fortune, Bossière by name, as captain of the Bonaparte rescue expedition. As the work of fitting out the yacht went on, Nicholas Girod furnished his home in all the magnificence required for the abode of an autocrat in a democratic land. 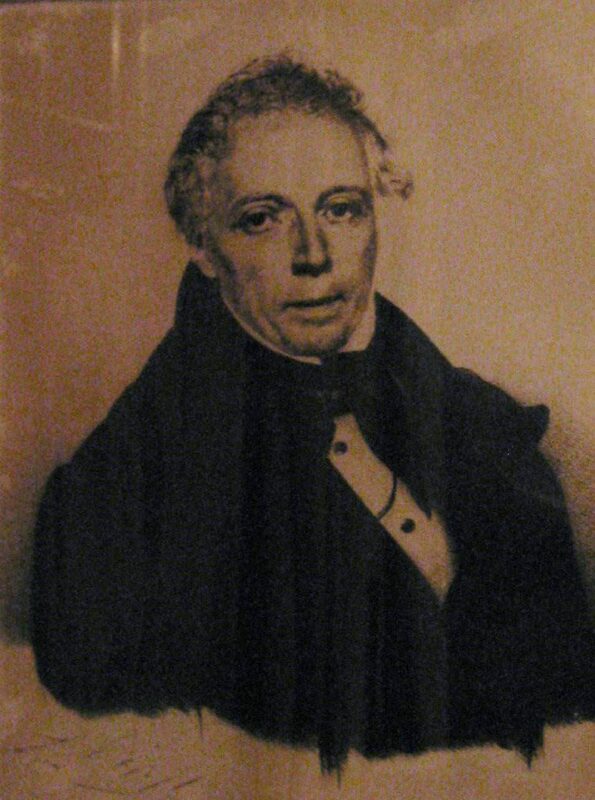 Girod served as a city alderman in 1824-1825, during the administration of Louis Philippe de Roffignac. When Roffignac proposed extending the levees along the river and the project was opposed by the Council, on the grounds that funds were lacking with which to pay for the work, Girod offered to pay for the extension at his own expense. This shamed the city fathers into authorizing the expenditure. Girod never married and had no children. When his neighbour J. Chesneau died (likely of yellow fever), Girod became the guardian of Chesneau’s three children, one of whom later sued Girod for illegally disposing of his father’s property. Girod died at his home on September 1, 1840, at the age of 89 or 93. He was buried in St. Louis Cemetery No. 2. Girod left hundreds of thousands of dollars to friends and charities, including $100,000 to the city of New Orleans to be used for the “construction of an edifice, in the parish of Orleans, for the reception and relief of French Orphans, residing in the State of Louisiana.” (6) Legal wrangling over Girod’s estate went all the way to the US Supreme Court, which handed down a decision in favour of the heirs of his brother’s estate, leaving only $28,000 for the city of New Orleans. Through sound administration the Girod fund grew and was used in 1870 to commence construction of the Girod Asylum, intended as a children’s house of refuge, on Metairie Ridge, behind St. Patrick’s Cemetery No. 3. The Board of Health subsequently examined the premises and found that – being located near a malarial swamp – they were unhealthful and unsuited for the purpose. Around 1906 (after the swamp had been drained), the buildings were turned over to the Society for the Prevention of Cruelty to Children, which established a home for destitute colored boys who had been committed to its care by the Juvenile Court. This was the Colored Waifs’ Home, where Louis Armstrong was confined in 1913-1914 and received his early musical instruction. Girod’s extended family lived in Napoleon House through the remainder of the 19th century. In the early 1900s different parties briefly owned the building. In 1914 it was rented by Joseph Impastato, who ran a grocery store downstairs and lived upstairs with his brothers and sisters. In 1920, he bought the property. The building became a bar and, in the 1970s, a restaurant. Napoleon House remained in the hands of the Impastato family for 101 years. In April 2015, it was sold to New Orleans restaurateur Ralph Brennan. If you are a Napoleon fan, Napoleon House is definitely worth a visit. You can enjoy delicious food and drink surrounded by pictures of Napoleon and memorabilia related to the building’s history. Sally Asher, Hope and New Orleans: A History of Crescent City Street Names (Charleston, SC, 2014), p. 94. Girod served as New Orleans mayor from October 8, 1812 to September 4, 1815, with the exception of a one-month leave of absence from November 6 to December 4, 1812. Mikko Macchione, Napoleon House (New Orleans, 2006), p. 54. Frank Dallarn, “Fire and Prohibition Rob New Orleans of Its Fame,” New York Tribune, February 8, 1920, p. 7. The first printed record of the plot appeared some 60 years after it purportedly occurred, in Will H. Coleman, Historical Sketch Book and Guide to New Orleans (New York, 1885), pp. 192-193. Macchione, Napoleon House, p. 30. North American and Daily Advertiser, Feb. 2, 1841. A very interesting story While it may not have really happened the things he did for the city and they people, especially the poor is most impressive. I am moved by the fact that in those days, people of power and wealth actually cared those who were in pain. Yes, Girod really was an admirable philanthropist. Shannon, What a great blog and story! I have been to both Napoleon House and Liberty Texas. I love the premise behind your work and have ordered your book! Best wishes! Thanks, Bob! That’s very kind of you. I’m glad you like the blog and I hope you enjoy reading Napoleon in America. I look forward to seeing that. Thank you for letting me know. Thank you for this information. It’s fascinating to learn that the Seraphine, in fact, existed. It would be interesting to know what year it was built (i.e., before or after Napoleon’s death). Bossière sounds like quite the character. I am the great granddaughter of Jean Franciso Girod, the brother of Nicholas and Claude Girod. I am been doing genealogy of the Girod family for twenty years. My cousin my sister and I spent a week in the private quarters of the Napolean House. I have hundred of documents regarding the Girod family of which a lot of them are in French. I have no doubt in my mind that the story of Nicholas Girod and Napolean adventure is true. I do have a document that shows that Nicholas Girod, who was an attorney, represented Napolean as his attorney. They were friends. I read the stories about the Napolean house and Nicholas and the rest of my family ….there are many details that are left out .. . I continue to research my family as it is a history lesson with them dealing with Jefferson, Adam, Jean Lafitte and many many others. They were massive slave owners/traders and property owners. They owned several plantations in the area. I have spent thousands of dollars acquiring copies of documents and have conversed with other genealogist in determining their ancestors connection to the Girod family. Thanks for these additional details. Those sound like interesting documents. 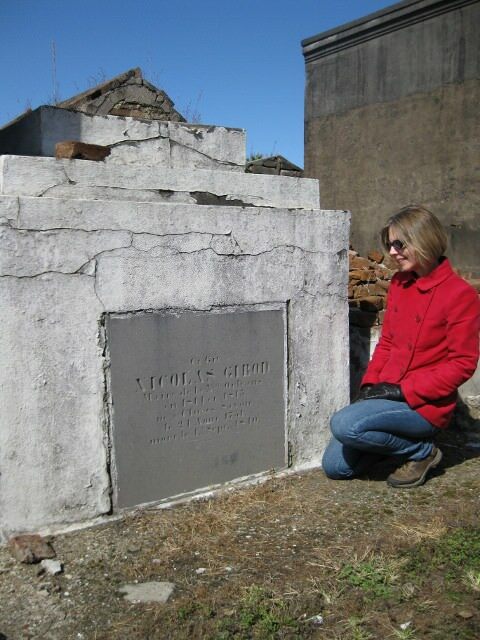 Jean Francois Girod was my 6th great grandfather, Mamie Girod Evans was my great grandmother. I’ve been trying to find Jean Francois Girod I & Jean Francois Girod II wives’ names. All I have found was they were women of color. If you have any information on them I would appreciate it greatly. Hi Fleta, I don’t have any information about the wives of Jean François Girod I and II. I hope one of the Girod family members who have commented on this post can help you out. I am Jean Francis’ great great great granddaughter, brother of Nicholas. My g grandfather is Jean Francis Girod lll, who passed in 1926. I would like to ask “rains” her lineage. My cousin has also done extensive research in France and La. My grandfather was Felix Isaiah Girod. It’s lovely to hear from you, Deb. Rains, what is your direct lineage? I also am a descendant. John Franciso Girod II, Severin Ardelias Girod Sr, Severin Ardelias Girod Jr, Clara May Girod Gilmore, Clarence A Gilmore (My Dad) is my family lineage. I just happened upon this article while surfing the net. Thanks for writing about our family. I enjoy history and really enjoyed this read. To the other Girods on the post, I’m also under Felix Isaiah’s line. He was my great grandfather, and Russell Emile was my grandfather. I once tracked out family line back to Nicolas, but never went any further other than to know his parents’ names were Sylvestri and Francesca. My pleasure, Todd. It’s great to hear from you. I’m glad you liked the article. Thanks for Nicolas’s parents’ names. I didn’t know who his parents were. I’m 4th gr-grandson of Francisco Toro, (1831-1895) native of Spain and died 22 Feb 1895 at “Girod at Montegut”. Francisco in 1850 is listed as barber’s apprentice, 1860-painter artist, 1870-physician. About his death record, Girod House at Montegut St. Does any Girod home or property lie in Italian Section of what is now Marigny-Bywater District ? Francisco Toro’s residence in 1880 census is listed as 205 Port Street, married Aug 1865 to Theresia Doignon Borne, Mandeville St. at Ascension Church. I don’t know the answer to your question, Marlon. Perhaps one of the Girod family members will be able to respond. Hi Paul, it’s lovely to hear from you. Hello, je ne sais si vous savez qu’à Thônes (Haute-Savoie, France) où Sylvestre Girod et Françoise Duboin étaient établis, on a étudié la famille Girod et publié un article sous la plume de Monique Fillion, présidente de la Société Historique. Je pense comme Shannon que cette histoire de l'”enlèvement” de Napoléon est en partie romancée (même si la correspondance des frères Girod entre 1799 et 1802 atteste l’attachement précoce de Nicolas à Bonaparte). J’aimerais beaucoup entrer en contact avec Rains, descendante de Jean-François Girod, pour lui demander en quoi consistent exactement ses papiers de famille et s’ils révèlent quelque chose de plus sur cet épisode légendaire. Pour Todd, Nicolas Girod était célibataire… Amicalement, Jean-François. Merci beaucoup, Jean-François. Je vais vous mettre en contact avec Rains. Thank you for this account of Nicholas. His brother, Jean Francois, was my 5th great grandfather. My great grandmother was Erma Jeanette Girod. Her father was William Kidd Girod, son of Theophilus, son of Jean Francois II. Theophilus left Louisiana , settling in Texas for a while before finally landing in Oklahoma. You’re welcome. It’s nice to hear from another member of the Girod family. Hello to Deb Allen, Todd Girod, A. Lane and other Girod descendants who have posted here. If any of you have any details on Sylvestre Francois Girod and his wife I would really appreciate it. There is very little documentation I have found on my Great+5 Grandfather and his wife. My Girod ancestry is listed at the end of this post. Welcome to the discussion, Sharon. I hope some of the other Girod descendants can help you with information about Sylvestre and his wife. Bonjour, Shannon. Le temps a passé depuis notre premier échange (2017) et je n’ai jamais eu de réponse avec Rain qui disait posséder des documents de famille… Pour Sharon Girod, je puis lui fournir les renseignements sur Sylvestre François Girod et Françoise Duboin, son épouse, originaires de Cluses (Haute-Savoie). J’ai transcrit et analysé la correspondance inédite de Nicolas, Claude-François et Jean-François Girod avec Thônes (entre 1799 et 1806) et dépouillé les comptes rendus de la gestion Girod à la NO (1812-1815). Cela me permet de proposer une conférence à l’Académie Florimontane d’Annecy, le 3 mars 2019, autour de la figure de Nicolas Girod. Friendly! Félicitations, Jean-François! Je suis sûr que votre conférence sera intéressant. Je regrette beaucoup de vivre trop loin pour y assister. J’espère que les autres lecteurs de ce post pourront aller. Voici plus d’informations pour ceux qui sont intéressés: http://www.academie-florimontane.fr/conferences-programme-du-premier-semestre-2019/. Thanks for your commentary, Shannon. I’ll try to make a synthesis of this fascinating life! But I didn’t receive any message from Rains or Sharon Girod and the descendants of Jean-François. That’s a pity because in investigation and research, as in battles, “union makes strength”! Friendly, Jean-François. How true, Jean-François! I do hope the Girod descendants will read this and contact you at some point. In the meantime, I wish you the very best with what I’m sure will be a fascinating presentation. And by the way, Jean Francois II and Nicholas were brothers. Nicholas came to New Orleans first and later, joined by Jean Francois. Thanks for joining the discussion, Randy. The news of Napoleon’s exile grieved M’sieu Girod sorely. Perhaps breathing the air of the land of the free made his bold Gallic heart bolder, and it may be that contact with the pioneers of the New World augmented his daring.